WASHINGTON- U.S. President Barack Obama?s recent pledge to seek a ban on space weaponsdrew a mixed reaction from experts in the field, with some saying the presidentmight be better off pursuing something more modest and less complex, such as aset of international rules governing space operations. Armscontrol advocates nonetheless applauded the statement as a welcome departurefrom the space policy stance of former President George W. Bush, who rejectedthe notion of banning or limitingspace weapons via treaty arrangements. ?The Bushadministration rejected space diplomacy,? said Michael Krepon, co-founder ofthe Henry L. Stimson Center, a think tank here. ?We refused to negotiate on anysubject that could limit U.S. military options. We have a shift from anadministration that was very dismissive of multilateral negotiations [as awhole], to an administration that is open to that possibility if it improvesU.S. national security.? Soon after Obamawas sworn in Jan. 20, the official White House Web site was updated with aset of policy guidelines including one on restoring U.S. leadership in space.Under the heading ?Ensure Freedom of Space,? the statement said the White Housewould seek a ban on weapons that ?interfere with military and commercialsatellites? ; assess possible threats to U.S. space assets and the best militaryand diplomatic means for countering them; and seek to assure U.S. access tospace-based capabilities, in part by ?accelerating programs to harden U.S.satellites against attack.? Obama?scampaign in 2008 outlined similar goals, saying an Obama administration wouldoppose putting weapons in space, seek rules of behavior for spacefaring nationsand reduce the vulnerabilityof U.S. space capabilities. The Bushadministration generally opposed international accords that might tie thenation?s hands in space. The National Space Policy issued by the Bush WhiteHouse in 2006 states in part that the ?United States will oppose thedevelopment of new legal regimes or other restrictions that seek to prohibit orlimit U.S. access to or use of space.? Meanwhile,the Pentagon during the past few years carried out or planned a number ofexperiments that critics charged were thinly veiled tests of space-basedweapons. Early last year, with then-President Bush?s approval, the Pentagon downeda wayward U.S. spy satellite using a sea-based missile interceptor. Expertsgenerally agreed that Obama?s statement signals a new direction in spacediplomacy, but some said it does not carry much meaning in the absence of keydetails, beginning with a good definition of the term space weapon. Coming upwith such a definition is complicated by the fact that any number ofconventional military and even commercial capabilities can be used to disruptor damage satellites. ?Obama isdelivering on his promise of more cooperation,? said retired U.S. Air Force Lt.Gen. James Armor, former head of the Pentagon?s National Security Space Office. ?I like the idea of working together more with our allies, but verification of[a ban on space weapons] is very difficult. If you can?t verify something, itmakes it difficult to build a treaty.? Armor saidObama?s statement could have implications for counterspace operations, which ismilitary parlance for the ability to either disrupt or protect spacecapabilities. ?My sense is this may make it a little harder to do counterspaceprograms, but we weren?t doing much of any offensive counterspace,? he said. ?Most of the Air Force?s efforts are in space situational awareness anddefensive counterspace.? TheresaHitchens, director of the United Nations Institute for Disarmament Research anda longtime opponent of weapons in space, applauded the White House statementbut said that given the difficulty of coming up with an acceptable definitionof space weaponry, a better approach would be to seek a ban on certainbehaviors. ?I wouldsay this is good starting language,? Hitchens said in an interview. ?? Theproblem is most space technologies have multiple uses, so the approach thatshould be taken needs to look at actions rather than capabilities. 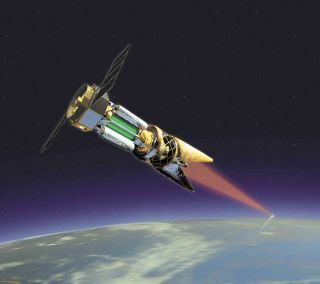 For example,a number of nations use lasers to track satellites, but lasers could also be used toattack satellites in space. So we should focus on outcomes rather thantrying to ban certain classes of technology.? JohnSheldon, a fellow at the George C. Marshall Institute here, said arms controlagreements are fundamentally flawed and likely to break down at the exactmoment they are needed. He said the United States would do more to protectspace security by taking the lead in pressing for informal rules of operationlike those used by commercial satellite operators around the world. ?We need toagree on a set of normative practices that will turn into a customary law likewe now have on the high seas,? Sheldon said. ?Most countries obey the law ofthe sea based only on centuries of customary practice. ?